I have decided to open this thread dedicated to answering the questions I regularly receive from non-members outside of the forum, be it via e-mail or other sources. For many years now, I have diligently responded to countless questions privately. Naturally, many of these questions turn out to be similar in substance, so I hope this thread will be helpful to clarify the most frequently asked questions submitted by newcomers to our research - and also relieve me a little from this pretty time-consuming burden! I have two puzzles, both somewhat related. The first is the planes and the passengers. Assuming the "no casualties" scenario where there are no planes and nobody in the buildings: did these planes leave their destination as the flights they were claimed to be? If not, wouldn't there be people (right down to baggage handlers) at the airport fully aware that no "flight 93" (or the other flights) actually left their airport? If there were actual flights - assuming they could be diverted and landed somewhere - who was on them? An empty plane would be noticed and remembered, too, even if all the documentation could be faked. My thinking is that the planes had to have left from their airports, and they had to have passengers. The manifest maybe could be swapped out for a fake somehow, but there would be missing people. Doesn't vicsims just create an unnecessary complication for the plotters? If you can divert the plane and land it somewhere and do away with the passengers, why bother with vicsims, when you have real victims at your disposal? As to your assumption that the four planes existed and took off from any airport that day, it is for you to provide us with any such evidence - since the relevant authorities (FAA, NTSB, NARA et al) appear quite unable to issue such information - and that is not for any lack of trying on our part (or indeed, by several other enterprising parties). You may read here the kafkian tale of our forum administrator Hoi Polloi's valiant and patient - yet vain FOIA efforts to retrieve any sort of relevant official paperwork documenting the existence of these alleged 4 flights and passengers. dg wrote: The second is the buildings. Assuming the no casualties scenario, there could not have been anyone in the buildings. They would have to be closed that day. Wouldn't thousands of New Yorkers recall this? People met there, there were daycares and coffee shops and so on in the building, and casual visitors such as tourists. Not to mention that "survivors" (of which there would be tens of thousands) would *universally* recall having been told not to come to work that day. That would include those employed not just by firms renting space in the WTC, but WTC employees themselves, security guards and cleaners and elevator mechanics and all of that. Beyond a handful of accounts (and none from WTC employees), I am unaware of any testimony of this sort. So, as you can see, your key question "wouldn't thousands New Yorkers recall that the towers were closed that day" is moot. Btw, if you believe there were 50.000 people in there - and only 3000 died - shouldn't we have tens of thousands of 'lucky-survivor-testimonies' by now? Where are they? And, indeed - where are the 9/11 victims? For those who still believe anyone perished on 9/11, please take some time reading the relevant 'vicsim' research on this forum. There really should be no doubt, at this point, that 9/11 was nothing but a massive hoax. Murdering 3000 'Wall Street people' was never part of the demented plan. A family member of mine was in Times Square NY on the morning of 9/11/2001 for his work. He told me recently that he remembers hearing the loud sound of a plane flying low over Manhattan - he didn't actually see one. I do not react to such comments, I find it wiser not to do so. My wife (we'll have been married for 50 years in February), my son, daughter, and son-in-law all think I'm nuts for reading September Clues and a few Dutch whistleblowers' sites about murders such as the Marianne Vaatstra case and the Deventer Murder case. I have come to the conclusion that it is best to keep my thoughts to myself for the sake of maintaining the peace at home. But my question is: is it known whether a plane flew at low altitude over New York that morning? Have there been more reports of that, does anybody know? Rudy Algera wrote: But my question is: is it known whether a plane flew at low altitude over New York that morning? Have there been more reports of that, does anybody know? Thank You - Just wanted to say thank you for the GREAT documentaries regarding the September 11 2001 event. I was there then, and have avoided the subject like the plague since then... I have seen many documentaries about it, all of which turned me off... And then there are yours. And now I feel compelled to talk and to thank you for being so level-headed about the whole fiasco. I moved to New York in August of 2000. Prior to that I lived in Petersburg Alaska (Little Norway). For many a summer I lived in Petersburgs "tent city" located at the end of the runway of their airport, which was large enough to handle anything up to a 707. Twice a day a 707 would fly into and out of Petersburg and I became quite accustomed to hearing those engines ripping the sky apart a few feet over my tent. That is a sound I will Never forget.... and which was strangely MISSING on that day in New York CIty (I was in the Village, on E4th St, between 1st and 2nd Ave, on the sidewalk, having my morning cigarette before going to work, when the first tower exploded) Multiple explosions? Yes, I heard and felt those...Jet Engines? Nope. Not one. Another thing that was Never Mentioned in the media is the FACT that shortly after (and I mean within Minutes) the first event, the entire island of Manhattan was Locked Down. No one got in, no one got out. In short, the island of Manhattan had been declared a 'terrorist target'. Our government decided to trap us here and let us 'fend for ourselves'. Again I thank you for your great work. For creating a series of documentaries that feel unbiased, that are factual, that are easily independently researched, and, I'm almost sad to say it, Entertaining as well as Educational. I pray that all the world takes the time to view them.Thank you. Thank you Very Much. ... WHERE ARE THOSE EYE-AND-EARWITNESSES ??? One thing to keep in mind could be this: sometimes there is no one answer to certain questions, obviously, since we were not there behind the stage when it happened. But one good exercise is to ask ourselves: would it be possible for this to happen? technically possible? To have no planes, no victims, no weird collapses etcetera? The answer is, as it has been proved time and again, undoubtedly, yes: it would be technically possible. Quite difficult to organize, sure, and it must have taken more than a decade: but possible. If only to fulfill the promise that "TV can make anything real". So... why not? Regarding the first "plane". I posted a video link either here or Reality Shack of a live outside broadcast from 2 blocks away at exactly the time of the first explosion. Unfortunately, I didn't save the video and cannot trace the original link, but if there HAD been a plane flying at 800 feet not only would the mics have picked up some sound, the people watching the OB would have turned to see what the commotion was. Here follows an e-mail I received from "edgewaters" - hopefully a future member of this forum. 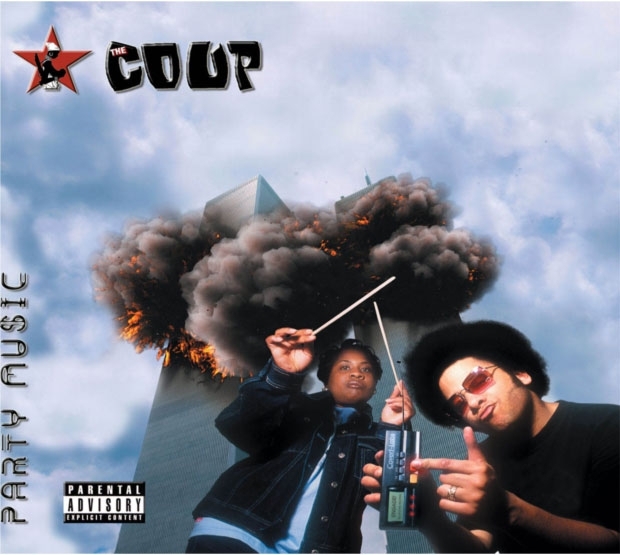 This album cover was posted on the internet on July 19, 2001.
edgewaters wrote: I'm sure you're familiar with the CD "Party Music" by the "Coup" and its cancelled front cover, which featured the towers exploding (at strangely prophetic locations). While the original cover was cancelled supposedly because it might be upsetting, they made sure a lot of people (who might otherwise never have seen it) got a good look at it by reporting on it and even displaying it. I remember the coverage. Because I already had some doubt in the back of my mind about the whole story, I was naturally curious, and went online to find out more. Now just the cover, perhaps if you were very inclined to believe the official story no matter what, you could chalk that up to pure coincidence. But if you did go look online you would find the inside jacket which again shows the towers - this time with 2 planes. At that point we're beyond coincidence. Further so if you take into account that one of the figures on the cover holds a detonator as the towers explode - which pretty much covers the two main theories that would emerge, bombs and plane strikes. The other figure holds a pair of conductors batons, like at an orchestra. Also the name of the group - "Coup" - predicts the "everything changed" theme. I think this was a message intended to reach those who might be skeptical. If you weren't skeptical, you didn't receive the message, but if you were skeptical, you went online and realized there was too much for coincidence here. And I think what happened to me, happened to a lot of people. You see the conductor batons, you see the bomb/plane thing, you see the foreknowledge, you see the smarmy grin of the guy with the detonator, and the whole thing comprises a display of awesome but hidden power - we can commit this crime right out in the open and you'll never even know who we are or how we did it, in fact, you're isolated, we've got everyone else marching to our tune, like a conductor. So you may as well go back to sleep cause there isn't anything you can do that will make any difference against the kind of power we have. So that's just what I did! Not consciously, really, I'm analyzing this now in a conscious way but I didn't really perceive my reactions at the time. This is how power is displayed now, I think. It's not just blunt and blatant violence. They demonstrate their control over the masses with the media, they demonstrate how covert and elusive their power is, they demonstrate your apparent isolation and marginilization. And all that IS a display of power, as much as any atrocity or act of violence. Moreso, even. In the time after that, from time to time doubt crept back. Then, I would go and look for alternate explanations and find only things like Alex Jones and David Icke. And I felt like I had to choose between that and the official story, and always, I'd find myself back with the official story - even though I doubted it, I believed it, seeing no better alternative. But I found something different with the work you've been doing. I was hesitant about an alternate explanation of no victims, your work looked good and all but on this I had some doubt. It seemed outlandish, like Icke and Jones, but the evidence for fakery was there. What to do, what to do. So I asked you about it. And you did something different ... you didn't say, "I know for a fact there were no victims because ... " but instead you turned it on its head, and challenged how I knew there were victims. Challenged me to prove them. You didn't ask me to subscribe to a belief, an alternate explanation about which I was supposed to be certain (but which would be confounded constantly, whether it was the official story or something else), but asked me to subscribe to what I'd been trying to get rid of ... doubt. So natural, so reasonable, so eminently logical and empirical. It's .... freedom. Of the mind. On a larger scale it would certainly enhance political freedom, too. So, thanks. In the future I'll be much more careful about wanting to have a belief, any belief, to fill the void of doubt. It seems to work much like religion in that way - and here I thought I was immune to that sort of thing. Never saw it coming from a secular angle. See you around Simon. If you ever find yourself in my neck of the woods (I live in Kingston Ontario) drop me an email if you'd like to be treated to a beer. Yes, edgewaters - what to say? This "Coup" cover just cannot be a random coincidence, can it? edgewaters wrote: And I think what happened to me, happened to a lot of people. You see the conductor batons, you see the bomb/plane thing, you see the foreknowledge, you see the smarmy grin of the guy with the detonator, and the whole thing comprises a display of awesome but hidden power - we can commit this crime right out in the open and you'll never even know who we are or how we did it, in fact, you're isolated, we've got everyone else marching to our tune, like a conductor. So you may as well go back to sleep cause there isn't anything you can do that will make any difference against the kind of power we have. I totally agree with this. It's true. This whole media foreknowledge thing, in movies and music and such, cannot be there just as a 'wink'. And the 'subliminal' angle isn't convincing either. Instead there is precisely this psychological effect: to suggest a power so globally pervasive and malicious to send people back to sleep out of sheer discouragement and hopelessness. "Look at that. Before 9/11, Twin Towers exploding on a CD cover. Of a rap album. I thought Rap was supposed to be against the system. Ouch. Better not go there." Or take the exploding towers sequence in Fight Club. Had that movie been done after 9/11, it would not have been nowhere that powerful. Instead its power is multiplied when one looks at it today, and realizes that those sequences (as those of many other movies) where filmed before 9/11, and that there is an obvious, scary connection between the two things that cannot be written off as simple coincidence. Better put that in a corner of the mind! If you think about it, this is exactly what an Alex Jones or David Icke does. While pretending to encourage people to rebellion, in fact they are painting a picture so bleak and so hopelessly pervasive and somehow eternal, like a subtle but unstoppable destiny of humankind, that any individual effort becomes useless. "The [insert shadowy global entity here] are everywhere and own everything and their traces can be found anywhere, even in your favorite movies and toys and music, and there is no way out". Overtime this becomes too much of a burden to bear, because there is never a release and an actual confrontation, of course, since the enemy is everywhere and nowhere. Eventually the followers will "delegate" the alpha rebel (aka cointel agent) to "tell on" the bad guys, accepting the idea that their part consists solely in buying the products he tells them to buy. I've been wondering where best to insert this "pilot" episode of a short-lived show called The Lone Gunmen. With the discussion of the media foreknowledge, I think it is fitting to post it here. This episode involves a govt plot to fly a plane into the WTC. Note that it aired in March 2001. ADMIN NOTICE (simonshack): Sorry, blndedbyscience, but I replaced your full-length Youtube version of the X-files "Lone Gunmen" episode with a short clip which most of us here at Cluesfoum are quite familiar with. This clip certainly needs to be viewed by many more people. I always got a puppeteer vibe from those "batons". But sure! The bandleader, indeed the man calling the tunes, the marionetist? whichever. "HEY, WHAT ABOUT THE HUNDREDS OF THOUSANDS OF EYEWITNESSES?" "I mean come on, Simon - there are 8 million people living in New York City! And they all failed to see the planes???" The above have to be the most common questions/objections I get from 'the man on the street' - when they first hear about September Clues. As I point out that NYC is full of high rise buildings, people will usually agree that this fact would have greatly restricted any clear view of the Twin Towers to street dwellers inside Manhattan. Naturally, the next question is: "Hey, but what about the people across the river?" Ok, granted: we are in the cold month of December here - so we can't really compare it to a milder September morning. But still : how many people do we see in this video? Tens of thousands? No. Thousands? No. Hundreds? No. How many can you see? Five? Six? nonhocapito wrote: I totally agree with this. It's true. This whole media foreknowledge thing, in movies and music and such, cannot be there just as a 'wink'. And the 'subliminal' angle isn't convincing either. Instead there is precisely this psychological effect: to suggest a power so globally pervasive and malicious to send people back to sleep out of sheer discouragement and hopelessness. "Look at that. Before 9/11, Twin Towers exploding on a CD cover. Of a rap album. I thought Rap was supposed to be against the system. Ouch. Better not go there." It's ironic though how they give their hand away. It's not just the mediums they choose that tell us their nature, it's their methods as well. The Coup cover, the towers in Fight Club, that Supertramp cover with 9 11 over the twin towers seen from a plane, the Lone Gunman - there's an old technique of fiction and theater and film at work here, it's called foreshadowing. These people are storytellers. They know how to do fiction, how to work an audience. They know all the tricks to achieve suspension of disbelief, how to deal with hecklers in the audience, how to make the audience relate to the story and its characters. With all this in play, how can it not be fiction? Real things don't use storytelling techniques! It's like the vicsims, one of the first things I noticed when I started looking into it was how they are all such nice people. Where are the pedophiles, wife-beaters, trashy tramps, thugs and just plain greasy, unlikeable individuals that populate real groups of people? Not on those planes, not in those towers! It'd be interesting to see if there were any criminal records among the whole bunch. Or nasty, violent divorces or other such things that are on public record. There's not one of them anybody is glad to see go, and that just doesn't pass the smell-test for reality with such a large group of people. They're all stock templates of the "ordinary hero" figure. The most inoffensive group of thousands that has ever existed! Icke and Jones, naturally enough, are seen to use storytelling techniques as well. They weave a picture for an audience. Theirs is more along the line of a stage performance than something like writing a novel or script for a movie, but it's still very much storytelling and shows all the signs of being so ... good use of metaphor, foreshadowing, allusion, setting the scene for a plot, it's all there. Even their style of delivery, its nothing but a standard soliloquy, and kept as such in the "greater act" by the fact the other characters (media, government etc) pretend to be unaware of them. After the JFK assassination hoax the media pushed the “JFK/Lincoln Coincidences List” -- with details evidently all planned out beforehand. This created a spooky air of “destiny” in the minds of millions of gullible people and further cemented the “reality” of the event while also inferring that higher powers were at work. edgewaters wrote: It's like the vicsims, one of the first things I noticed when I started looking into it was how they are all such nice people. Where are the pedophiles, wife-beaters, trashy tramps, thugs and just plain greasy, unlikeable individuals that populate real groups of people? Not on those planes, not in those towers! It'd be interesting to see if there were any criminal records among the whole bunch. Or nasty, violent divorces or other such things that are on public record. There's not one of them anybody is glad to see go, and that just doesn't pass the smell-test for reality with such a large group of people. They're all stock templates of the "ordinary hero" figure. The most inoffensive group of thousands that has ever existed! Excellent analysis, making a point I had not previously considered. I haven't read most of the 9/11 material on the forum, so forgive me if this question has been covered already. The official timeline states that the First plane hit at 8.46am and didn't collapse until around 10.30am, so in this period of time when they are showing the burning towers on the news, what would a nyc local have seen if they were to have looked at the towers? Surely the demolition would have to have been in sync with the tv reports? EDIT:i think I know the answer to my first question, I just watched the Fox Flop video on youtube and seen it mentioned that military grade smoke obscurants were used. ShaneG wrote: I haven't read most of the 9/11 material on the forum, so forgive me if this question has been covered already. Sorry for late reply, ShaneG - just realized I hadn't responded to your above post. Your questions are of course valid and interesting - and I fully realize they must be shared by many people. To be sure, none of us can pretend to figure out exactly how it all played out in reality. Yet, we may attempt to draw possible / plausible hypotheses - knowing what we know now. However, allow me to slightly re-formulate your core question (as of my underlined subtitle below). WHAT WAS SEEN BY NEW YORKERS - IN REAL LIFE? "What may NYC locals have seen (or heard) that day - that didn't match what they later saw on TV replays?" Firstly, I think we may safely say that, ever since the earliest morning hours, the southern tip of Lower Manhattan was tightly sealed-off / 'off-limits' to any civilians - and under firm control by the military/ FEMA/ NYPD/ CIA/ FBI and the lot. For this trained army of officials, to keep NYC locals off the streets - and away from the (limited) street-locations from which the twin towers were viewable - would not have been a difficult task. Remember that September 11 2001 was also NY mayoral election-day, so for instance, any policemen setting up road-access restrictions or the like would not need to be 'in on it'. As for people looking out the windows of high-rise buildings (adjacent to the WTC complex area), well, evacuation alarms were apparently set off all over Manhattan - soon after the alleged "FLIGHT 11" crash - at 8:46am. All this would have reduced to a bare minimum the number of NYC locals who would have been able to observe the towers from any ideal, elevated or close-up vantage point - let alone compare IN REAL TIME what they saw in real life - with what was being shown on TV. Secondly, we must recall what we were actually shown on TV. Well, what we saw during the first hour or so - between 8:52am (as the first networks started reporting "some incident at the WTC1") - and 9:59am (as some networks aired the WTC2 collapse "live"), was basically just (flameless) smoke, slowly billowing out of the top WTC floors - purportedly filmed by TV choppers hovering at some distance. As for the first - totally unexpected - "event of 8:46am"("FLIGHT 11 smashing into North face of WTC1"), a few explosives would have done the job, opening a row of upper-floor windows - with smoke-generators pumping out an ugly smokeplume. In fact, the absurd lack of NYC locals reporting what would have been THE LOUDEST event of the day (a 900km/h jumbo hurtling down over the full length of Manhattan at low altitude) is probably the most surreal aspect of the extant "eyewitness record" of the day. But this split-second, short-lived (non-)event shown on TV would hardly be a problem for any NYC locals (who never saw it with their own eyes) to "live with". They would just assume that they missed it - for one reason or the other. Of course, and most "conveniently", this imaginary 'second plane' would have struck the South side of WTC2 facing the sea - and thus on the 'dark side' of most New Yorkers who were, by now, being briskly ushered uptown. If some "BANG" was heard on 9:02 by any NYC locals, that may just have been the explosives opening another row of windows for another smokeplume gush out from the south side of WTC2. This much may have - perhaps - been in sync with what was shown on TV. So again, "what would NYC locals have seen (or heard) that day - that didn't match what they later saw on TV replays?". 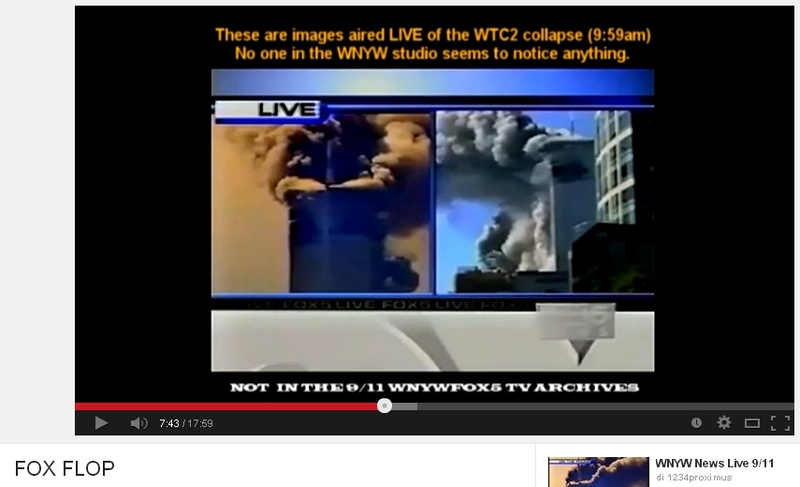 Most importantly, we have to remember the ABYSMAL quality of the TV imagery aired LIVE on 9/11. NO DISTINCT PLANE GASHES, for instance, were distinguishable by TV-viewers ON THE DAY. Keep this in mind, as it bears particular significance towards deconstructing (or 'reverse-engineering', if you will) the magic trick / sleight of hand that was played out on that day. As I'm sure any stage-magician will tell you, TIMING is an essential component to ensure the success of any mass-illusion performance. And we know that the timing of the release of gradually sharper 9/11 images spread over almost a full decade (as the never-before-seen NIST imagery was 'revealed' ...in 2010!). This brings us to our last "eyewitness quandary": did New Yorkers - did ANYONE AT ALL - witness the tower collapses? 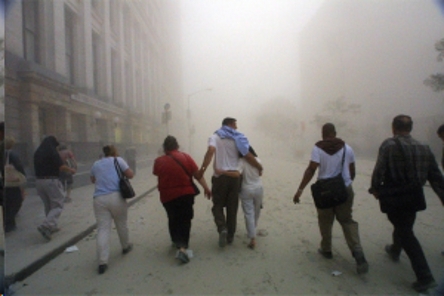 And if military-grade smoke obscurants were employed to cloak the view of the WTC area (perhaps the oldest trick in the warfare book), wouldn't anyone who happened to see (or even photograph from afar) that foggy smoke cloud rising from street-level upwards - PRIOR to the stated collapse timeline(s) - raise hell about it? Well, that's when those phony, HIGHLY publicized 'firsthand witnesses' such as Willy "BOOM" Rodriguez 'come handy' (for the perps) and start to make sense (for us): Willy "BOOM" Rodriguez (the "Carlos Arredondo of 9/11" - a former magician trained by James Randi but sold to the public as the "WTC janitor"), was instrumental in spreading the myth of "multiple bombs going off - BOOM! BOOM! BOOM! - in the WTC basement", PRIOR to the 'plane strikes". His tall tales included "elevators on fire crashing down in the WTC lobby - setting off a flaming inferno at ground level. 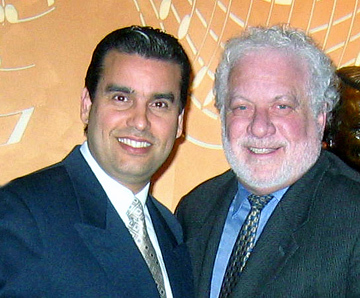 Willy's ridiculous narrative was likely scripted in order to provide a "plausible deniability" scenario to defuse any damning testimony to (or imagery of) ground-level smoke in the WTC area - PRIOR to the tower collapses. In fact, the only logistical 'worry' of the 9/11 planners may have been this timing issue: to start raising that enormous smoke cloud (that eventually covered most of Manhattan) slightly PRIOR to the actual tower demolitions. So, then: what would NYC locals / civilians have seen(providing anyone was still roaming around the area) if they were to have looked at the towers - at 9:59am, as the first one (WTC2) was shown collapsing on TV)? 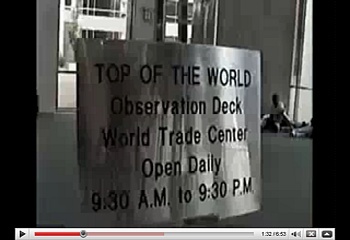 What if YOU had snapped the above image at, say, 9:55 (four minutes PRIOR to the WTC2 collapse). Could you prove it - in a court of law? All in all, it would not be unreasonable to contend that, once the WTC area was sufficiently enveloped in smoke obscurants - the towers were demolished at any given time thereafter - either one by one - or perhaps even simultaneously.